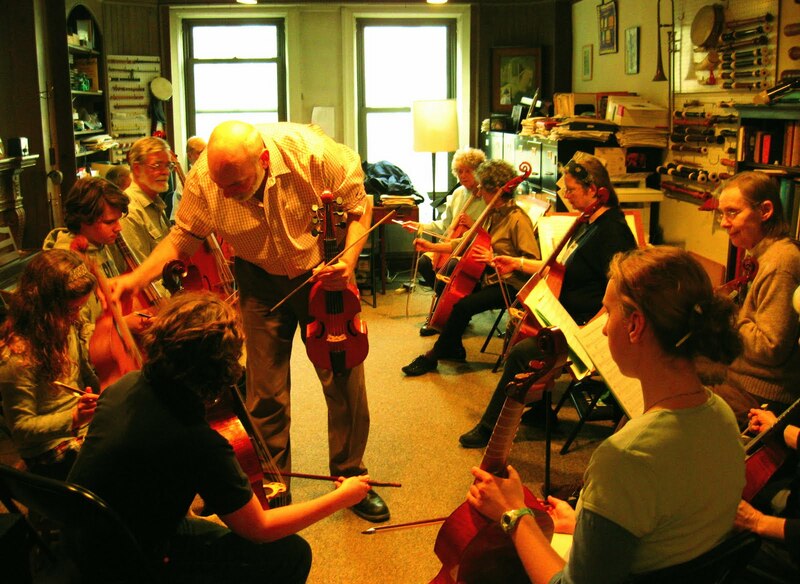 The Viola da Gamba Dojo of New York's Spring Play-In/Concert is now confirmed for Saturday, May 14 at Our Saviour's Atonement Lutheran Church at 178 Bennett Avenue. Repertoire to be played will include works at a wide range of levels of difficulty, so no player is too young and none too advanced to play. The regular Dojo attendees are preparing William Byrd's In nomine à 5 #5, madrigals of John Wilbye, and items from the Repertoire of the Viola da Gamba Dojo. Additional repertoire will be chosen appropriate to the players who plan to play. I will send parts to players who would like to play but are unable to regularly attend the Viola da Gamba Dojo's Saturday morning sessions. 3:00 The youngest players will join the rehearsal in progress. And please watch this space for further developments regarding The Viola da Gamba Dojo of New York's Boston Early Music Festival performance on Saturday, June 18; and The Viola da Gamba Dojo of New York's collaboration with the English viol consort, Gutted, in early July. Yesterday's Dojo was very fun and deluxe. In attendance were Martha Bixler, Ella Blood, Jackson Blood, Walker Blood, Susan Daily, Janet Hassett, Hans and Judy Lie, Deborah Peters, Linda Plotkin, Sig Rosen, John Mark Rozendaal, and Heather Spence. We practiced open string bow strokes; G-Major Scale; Folia variations; Dojo Book 2, numbers 6 - 10; John Wilbye's 'Happy Streams Whose Trembling Fall'; and William Byrd's fabulously In nomine à 5 # 5. Next week (February 26) our practice will include Dojo Book 2, numbers 11-15; and John Wilbye's 'Change Me O Heav'ns'. Saturday, June 18 - I have submitted application for the Dojo to perform at the Gamba Gamut to be presented by the VdGSA as a Boston Early Music Festival Concurrent Event. July 1 - 7 The English viol consort "Gutted", comprised of students in Jacqui Robertson-Wade's Warwickshire early music program in Warswickshire, will be visiting New York CIty. Stay tuned for information about a Gutted/Dojo collaboration that week.